New!! Renew Dog Licenses On-Line! 1. VALID DRIVER'S LICENSE FOR EACH APPLICANT or NON-DRIVER ID WITH PICTURE. 2. BIRTH CERTIFICATE WITH RAISED SEAL (MUST SHOW BOTH PARENTS' NAMES AND BE AN OFFICIAL COPY). 2. IF EITHER PARTY HAS BEEN PREVIOUSLY MARRIED, A JUDGEMENT OF DECREE of DIVORCE MUST BE SIGNED AND DATE STAMPED BY THE JUDGE. New Passports: The Town Clerk's Office serves as Acceptance Agents for NEW passports only. Call for more information regarding the doccuments that are required for new passports. Passport renewals CANNOT be processed by Acceptance Agents. For information visit: https://travel.state.gov/content/travel/en.html. Dog License Renewal: In person: 9:00 AM to 4:15 PM - or ONLINE anytime! Click the link above to renew a dog license online. Please note: If services are needed after normal business hours the Town Clerk is available by appointment. Call 315-638-0224 to schedule an appointment. 2018 Town Board Meeting Schedule. The Town Clerk’s Office is a great place to start if you have any questions about any aspect of Town Government and services the Town provides. We encourage you to give us a call and we'll gladly answer your questions or refer you to the appropriate department. If you would like a copy of the Town Board Meeting Minutes sent directly to you, please feel free to contact the office via email at townclerk@townoflysander.org. Our system is completely safe and free of viruses. It is our pleasure to serve you! The Town Board meetings are held the first and third Thursdays of the month at 7:00 pm. See the 2018 Town Board meeting schedule. Please look below at our important links for more information. You can view the meetings and meeting minutes in the board meetings section. The Town Clerk’s office is a local resource for all dog licensing issues. All dogs 4 months or older are required to be licensed. License renewals, license tag replacements and dog redemptions are provided through the Town Clerk’s Office. The Town Clerk’s office is a convenient location for NYS fishing, hunting, trapping, bow hunting, muzzle loading, turkey permits, lost licesnses and lifetime sporting licenses. Licenses are also available for purchase through the New York State Department of Environmental Conservation at www.dec.ny.gov. For more information contact our office at 316.638.0224 or the DEC at 518.402.8843. Marriage licenses and transcripts are available during normal business hours by appointment. Please call to make an appointment and information. Honorable Charles J. Mantione Jr.
As a precaution to residents, please be advised that while driving, parking permits should not be displayed from your rear view mirror as you may be ticketed for “obstruction of view”. 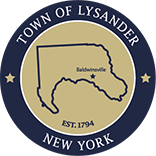 Anyone wishing to see or get copies of any Town of Lysander documents must utilize a FOIL Request form (Freedom of Information). Please download, fill out and mail to Dina Falcone, Town Clerk, Town of Lysander, 8220 Loop Road, Baldwinsville, NY 13027, or email to townclerk@townoflysander.org, or fax to 315-635-1515, or bring the form into the Town Clerk's Office. Please call with any questions: 315-638-0224. The Onondaga County Board of Elections has now taken over the election process. If you would like information regarding your voting district, you may call the Onondaga County Board of Elections: 315-435-3312, or visit their website: www.ongov.net/elections. For your convenience, voter registration forms are available at the Town Clerk’s office. For a comprehensive guide regarding passports, please visit: www.travel.state.gov. You may fill out passport applications online. Forms are also available at the Town Clerk's Office. Recycling “Blue” Bins are provided to Lysander residents by Onondaga County for collecting your recyclable materials. Blue bins are available at the Town Clerk’s Office. Each household is asked to take no more than two blue bins. You may call to confirm bin availability 315-638-0224. For more information on recycling, contact the Onondaga County Resource Recovery Agency. Brush and Yard Waste - The Town does not pick up brush and yard waste. Disposal of this material can be taken to the closest OCRRA site at 6296 Airport Road, Camillus, NY 13209. For hours and fees please contact OCRRA at 315-453-2866 or visit their web-site at OCRRA.org. Answering Machines, Calculators, CD/DVD Players, Chargers, Circuit Boards, Computer Peripherals, Computers & Laptops, Copiers, Digital Cameras, Fax Machines, GPS Units, Ink Jet Cartridges, Laser Toner Cartridges, Microwaves, Monitors, Network equipment, Paper shredders, Radio's and Turntables, Routers, Scanners, Servers, Speakers, Telecom Equipment, Televisions, Terminals, Uninterruptable Power Supply Equipment, Video Game Systems, Wiring and Cabling. ITEMS NOT ACCEPTED: Air Conditioners, Dehumidifiers, liquids & powders, CFL's and other light bulbs. PLEASE CALL THE HW DEPARTMENT BEFORE DROPPING OFF ANY ITEMS: 315-635-5608. The Highway Department's hours are 7:00 AM to 3:00 PM.